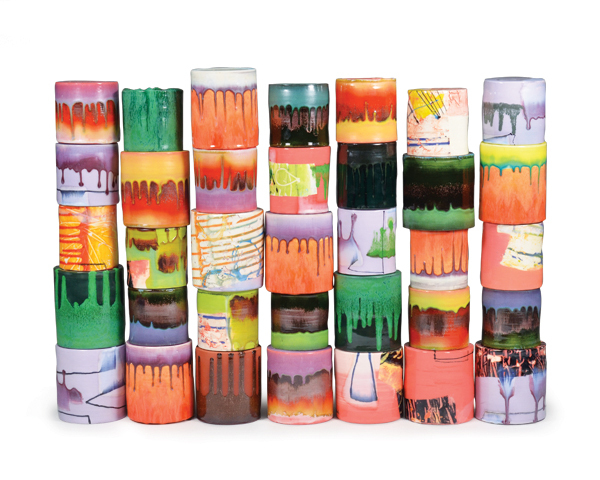 “Contextualizing Ceramic Color” by FSU Adjunct Instructor Marty Fielding, was published in the September 2018 issue of Ceramics Monthly magazine. In the article Fielding gives a primer or refresher on color theory. He also discusses previous limitations in using color due to the ceramic process and advances in colorant chemistry and technology that have advanced the accessibility of color to ceramic artists. The theory spotlighted in the article draws from the seven types of color contrast listed by Johannes Itten and other interactions noted by Josef Albers. In addition to established texts, Fielding surveyed artists about their reasons for using color and how they use color to convey content. Insights from this research add context to visual examples in the article. In the spirit of Itten’s book “The Art of Color”, Fielding analyzes the color interactions at play in 7 works by contemporary ceramic artists spanning sculpture, figurative, vessel, and multi-media approaches.